It was a very special gift to have Nancy bike the final miles with me to the Atlantic Ocean pictured above (taken by our friend Carol) for the official conclusion of my grand adventure bicycling 4,085 miles and climbing 114,562 feet from Anacortes, Washington to Freeport, Maine. Knowing that today was my final bicycle ride of the cross country adventure, I admit sleeping was difficult. I was awake by 6 am and ready to go. However, today’s ride was very short, 50 miles to Freeport, Maine and 4 more miles from Freeport to the Atlantic Ocean. Considering the terrain, it appeared the ride was only going to take about 4 hours. 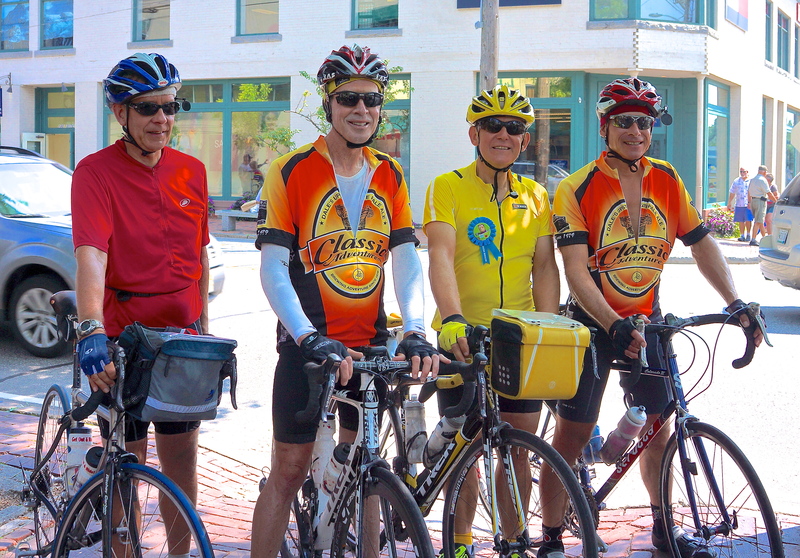 Doug, Robert, Jim and I agreed that we would meet at noon a corner just outside downtown Freeport so that we could ride together into town to the cheers of Doug’s wife and sister, Nancy, and friends Carol and Al (who bicycled across the country last summer). I was so anxious to complete the ride and see Nancy, I was the first one on the road this morning (7:30 am) and only stopped for water. 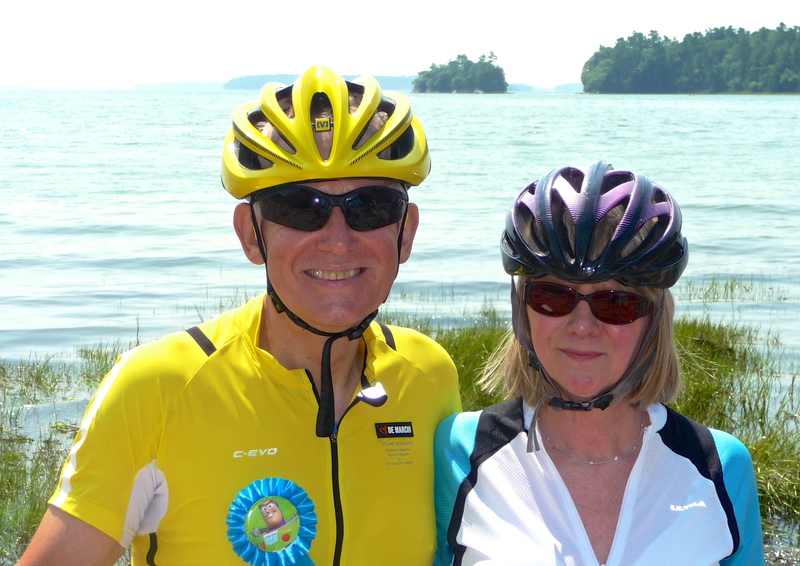 My focus on the biking today resulted in my 1) only taking one photo during the ride (see photo below of Joanne and John) and 2) arriving at the designated corner in Freeport at 11:15 am (Jim, Robert and Doug arrived together about 11:50 am). The shock of the day occurred at just before 11 am when I was about 4 miles from Freeport. To my joy Nancy pulled up next to me in our SUV for the first eye-to-eye contact we have had in over two months (64 days to be exact). With both of us trying to avoid a collision because we were so focused on each other, we found a pull off just ahead and celebrated the moment with a long and passionate kiss. It was only after the kiss I noted that friends Carol and Al had joined Nancy and pulled over for a reunion. Hard as it was, Nancy and I parted so she could get setup at L.L. Bean’s for the arrival of the four cross-country bikers and have her bicycle ready to join me for the final 4 mile ride to the Atlantic Ocean. 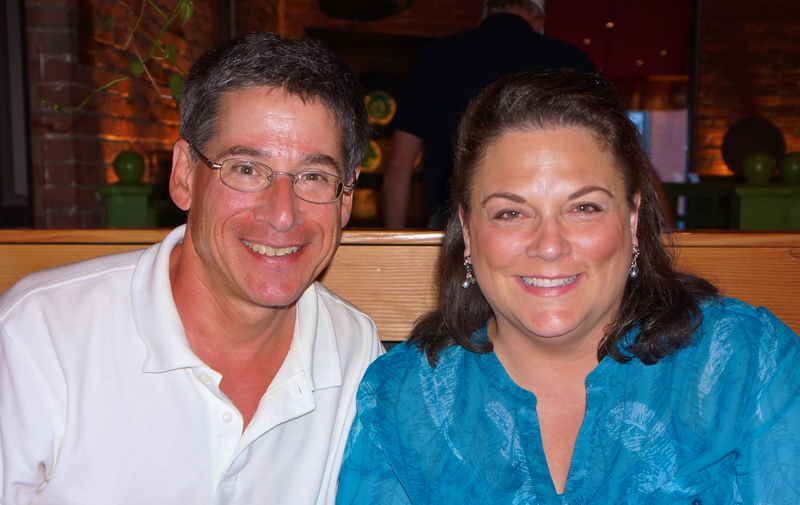 After Doug, Jim, Robert and I met outside Freeport, Doug got on the phone with his wife Lisa (see photo below of Doug and Lisa) and I got on the phone with Nancy trying (with great difficulty) to connect his family and Nancy/Carol/Al at the L.L. Beans complex so they could be together for our group arrival. Finally, after many cell minutes , it was clear to Doug and me that they had found each other and were ready for our grand arrival. Doug, Jim, Robert and I mounted our bikes for the ride to a reception at L.L. Beans in Freeport, Maine. As we rode into downtown Freeport (which was mobbed with people and autos), a sudden chorus of “pops” and voices rang out as a crowd of people (10 actually) waved and yelled as our group of four bikers arrived at the corner in Freeport where L.L. Bean was located. Doug was surprised for the third time on this trip with unexpected family members greeting him. While he was expecting his wife and sister, greeting us were also his son and daughter-in-law and his daughter (see photo below of Doug’s family). Joining family and friends for our arrival at L.L. Bean were also fellow bikers Joanne and John who had arrived earlier at L.L. Beans. Nancy was there with balloons and a badge, “Action Hero” which she pinned on me. The celebration at the arrival of four cyclist at L.L. Bean led bystanders to ask if we were celebrities or professional athletes. I must admit it was a hoot to get this kind of unexpected attention. 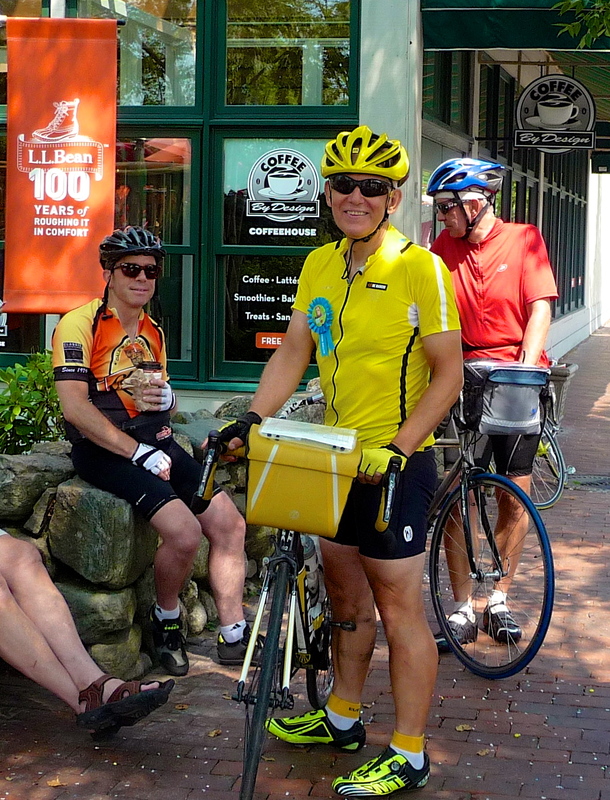 After many introductions, handshakes, kisses, and congratulations in downtown Freeport, everyone was off on a bike or in a car to the Atlantic Ocean 4 miles away for the formal dipping of front bicycle tires by Jim, Robert, Doug and me. Joining the four of us on bicycles to the Atlantic Ocean was Nancy, who was unmistakable due to the six helium celebration balloons she had tied to her bicycle. I was very impressed to note that Nancy was easily able to keep up with me on her bike (actually passing me on one hill). The celebration continued for everyone (including bikers Steve and Sharon) at the Atlantic Ocean where the four cross country cyclists had individual and group photos taken with bicycles (front tires resting in the Atlantic Ocean) by a dozen or more cameras. Then it was a photo session with family and friends. Finally, it was time to bike back to Freeport, where with a great sense of accomplishment (and a little sorrow), I ended the bicycling element of this adventure by mounting my Trek on our SUV. Two more events occurred before we disbanded and went our separate ways. A wonderful celebration dinner for all cyclists (the four cross-country group as well as the 10 who joined us in Brockport, NY), family, and friends was hosted by Dale and Diane at Linda Bean’s (grand daughter of LL Bean) Maine Kitchen and Topside Tavern in Freeport, Maine followed by a round of final comments by Dale, Diane, Doug, Jim, Robert, and me. After a good nights sleep, Robert, Jim, Doug, and I met in the morning for a final farewell before Jim and Robert left with Dale and Diane for the Airport in Portland, Maine, Doug left with his family for a long weekend reunion in Portland, Maine, and Nancy and I left for a week’s vacation (biking and hiking) in Kennebunkport, Maine and Wolfeboro, New Hampshire. I am at a loss for more words at the moment, but will spend the next several weeks compiling my final thoughts, perspectives and insights about this adventure. If you would like me to comment on any particular aspect of the adventure (I have already been asked to share my favorite state, hardest biking day, best restaurant and hotels, personal learnings, etc), let me know. Thanks for your support, feedback and encouragement over the last two months. I look forward to personally connecting with each of you in the coming weeks. Till then, best wishes to everyone. 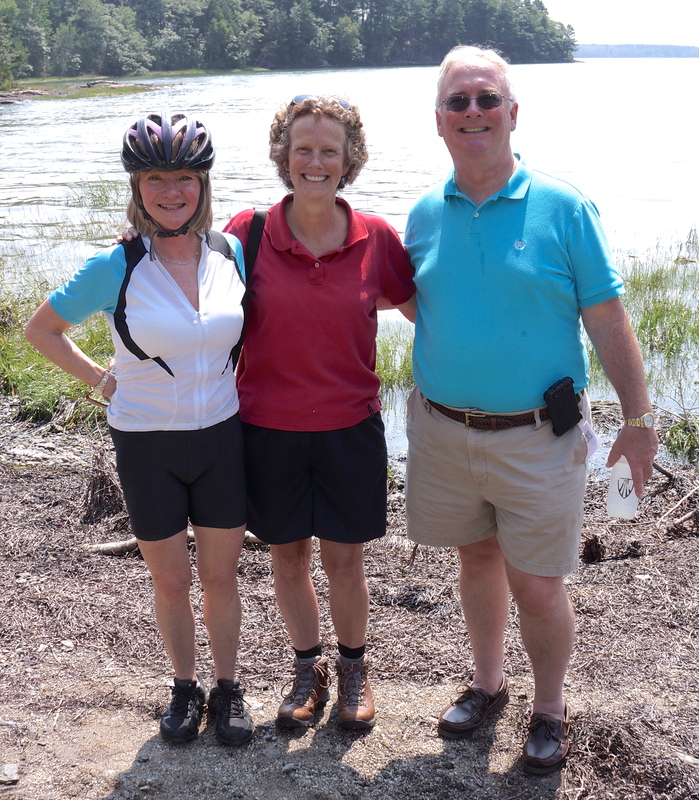 Joanne and John from Avon, Connecticut who I bike with for some of today’s miles. Mile 52: Jim, Robert, me and Doug upon our arrive to the cheers of the crowd (actually 8 people – Doug’s wife, sister, son, daughter, and daughter-in-law as well as Nancy, and our friends Carol and Al, who bicycled coast-to coast last summer) when we arrived outside L.L. Bean in Freeport, Maine. The four of us met at a corner just outside of town so we could ride into Freeport together. The commotion of our friends and families at our arrival at L.L. Bean led bystanders to ask if we were celebrities or professional athletes (I must admit it was a hoot to get this kind of attention which was completely unexpected). At this point we still had 4 miles to cycle for the official completion of a coast to coast bike trip by dipping our front tires in the Atlantic Ocean. John (left) and Jim (right) with me outside L.L. Bean just after our arrival in Freeport, Maine. Mile 4,085: Dipping my front tire in the Atlantic Ocean near Freeport, Maine. My friend Al and me at the Atlantic Ocean near Freeport, Maine. Al bicycled coast to coast last summer and provided me valuable advice as I planned my own trip. Nancy and our friends Carol and Al at the Atlantic Ocean. Nancy was dressed in her bike attire and had her bike ready when I arrived at L.L. Bean in Freeport, Maine so she could ride the final 4 miles with me to the Atlantic Ocean. Thanks to Carol and Al for hosting Nancy at their Maine retreat the evening before I arrived and for making the special effort to be there for my arrival in Freeport and joining the celebration. Doug and his wife Lisa at our final dinner at Linda Bean’s (grand daughter of LL Bean) Maine Kitchen and Topside Tavern in Freeport, Maine. 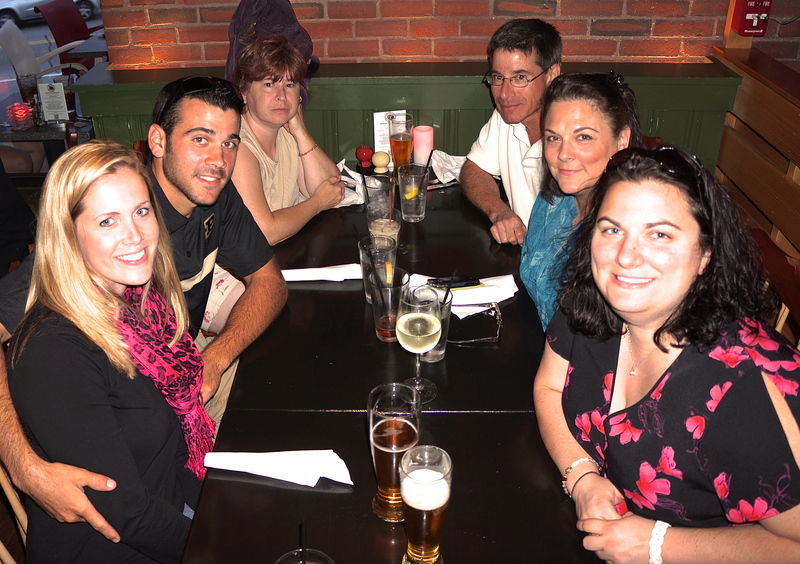 Doug and his family at the final dinner at Linda Bean’s (grand daughter of LL Bean) Maine Kitchen and Topside Tavern in Freeport, Maine. This entry was posted on August 23, 2012 by Steve. It was filed under Photograph of the Day . You certainly have our cheers and congratulations! I have enjoyed your journey. Hooray HOORAY FOR STEVE!!! You actually did it! Kirk and I are so proud to know you! We can’t wait to hear about your odyssey in person. Steve, Congratulations on your amazing accomplishment! It has been such a pleasure following your journey these past months. Thank you for sharing it with us. What an amazing end and celebration in Freeport. Steve, Congratulations to you on this accomplishment. It has been a pleasure to follow your journey. What an amazing end and celebration in freeport for you, Nancy and your fellow riders!